Being brought up on a diet of black and white films - back in my formative years the BBC daytime schedules were not full of programmes about the crap in your attic or vicarious house hunting - has had many personal consequences: a disregard for authority instilled in me by too many Ealing comedies; a reputation for being recondite that is useless, except in pub quizzes; and a disconcertion when it comes to windmills. Alfred Hitchcock’s 1940 spy thriller Foreign Correspondent left an indelible mark. Starring the American Joel McCrea and supported by the urbane and English George Sanders, the perpetual chase of the film at one point leads to a Dutch landscape overpopulated by slowly turning windmills. The tension of the scene, as McCrea secretly observes the menace of the kidnappers of the drugged diplomat Van Meer behind the ostensibly benign façade of one of the windmills, terrified me; but only as much as the strange, dead ambience of a Hollywood studio set masquerading as countryside. Since then windmills have been a symbol of hidden menace. A fear, I fear, I have passed on to one of my sons who, from the age of two, could not walk past our local windmill. Often we would walk up the hill, only for him to panic and refuse to go on as the mill came in full sight, just like Michael Palin’s teacher character in Alan Bleasedale’s GBH who, everytime he had to cross a bridge, froze. Our local windmill is magnificent: in a county renowned for windmills the Windmill Hill windmill is the tallest in Sussex and the second tallest in Britain. Built in 1814, it is one of the remaining examples of a post mill in its original condition. 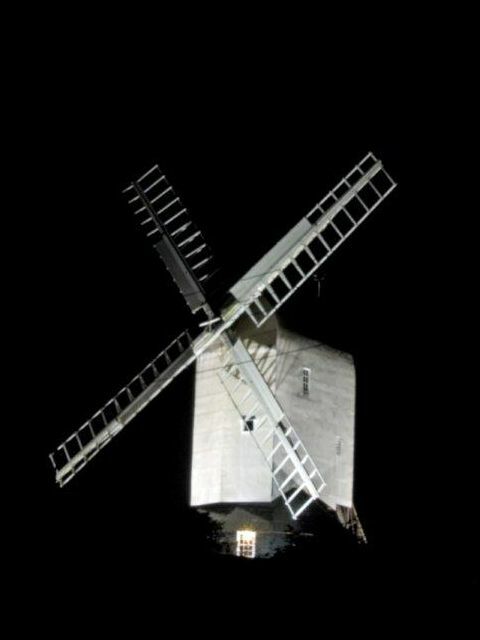 After a chequered ownership throughout the second half of the twentieth century, a trust acquired the mill in 1995 and completed a ten-year programme of restoration with funding from the Heritage Lottery Fund, English Heritage and county and district councils. A post mill is a timber building supported on a vertical post which acts as a pivot so that the mill can be turned to face the wind. When we first moved here my ignorance led to confusion: every time I glanced up at the windmill, it seemed to be facing a different way; that’s because it was. The mill is now open to visitors on out-of-winter Sunday afternoons and some extra days on bank holiday weekends, with entrance by donation. My son has overcome his fear: he has not just walked past the mill but been inside it and climbed all the way to the top with me. That was an exhilarating experience but I had the scene from Foreign Correspondent in my mind all the time. I think that the Windmill Hill windmill is best enjoyed after dark when it is beautifully lit and I can see its white, spectral shape against the night sky from behind the safety of my window. Great stuff! But how can you be worried about Windy Miller's house? Surely the stop-start animation and subtle voice of Brian Cant should have soothed any concerns. And it was in colour, one of the first childrens animation to be so. Or perhaps your insipration comes more from Don Quixote....?! Yes!Camberwick Green as an antidote to the Hitchcockian horror. You know what you've done now, though: I watched the opening credits on YouTube and dissolved into a horrible mess of self-pity for my lost childhood. Mickey Murphy the Baker! Boo hoo!